Dr Adam Fraser is a human performance researcher and consultant who studies how organisations adopt a high performance culture to thrive in this challenging and evolving business landscape. While other speakers talk about research, he does the research, partnering with various Universities through Asia Pacific. He is at the forefront of how neuroscience and positive psychology can be used to improve work place performance. In fact he is thought to be the only keynote speaker in the world to have had the impact of his keynote presentation measured in a University study (It improved the behaviour of attendees by 41%). 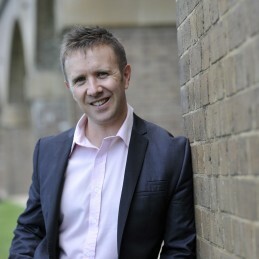 He has worked with elite level athletes, the armed forces and business professionals of all levels. In the last 5 years he has delivered more than 600 presentations to over 50,000 people in Australia, New Zealand and Asia. He has worked in many industries and his clients include, CBA, Westpac, Optus, IBM, ABN AMRO, PWC, Asteron, AON, Tower, Local Government Managers Association, Merck Sharpe & Dohme, Queensland Law Society, and the Department of Education. His topics included the psychology of performance, improvement of productivity, transformational leadership, engagement of teams, work life balance and development of high performing cultures. He is regularly featured in the media. Having appeared in the Australian Financial Review, CEO magazine, Business Review Weekly (BRW), Fast Thinking, Readers Digest, Human Capitol magazine and Management Today. He has held regular radio spots on ABC 702 and his own slot on Sky Business. He is also regularly on Channel 7’s Sunrise & The Morning Show, Kochie’s Business Builders, Channel 9’s Today show and Mornings, What’s good for you and Close Up in Auckland. In addition to his work in the area of performance Dr Adam also directs a company called The Glucose Club. The main focus of The Glucose Club is to provide lifestyle programs, education and support to people with metabolic health problems like obesity, diabetes, syndrome X, high blood pressure, high cholesterol, to mention a few. The Glucose Club has recently finished a national research project with the health fund GU Health, which showed that physical activity and dietary change can dramatically reduce the severity of diabetes.